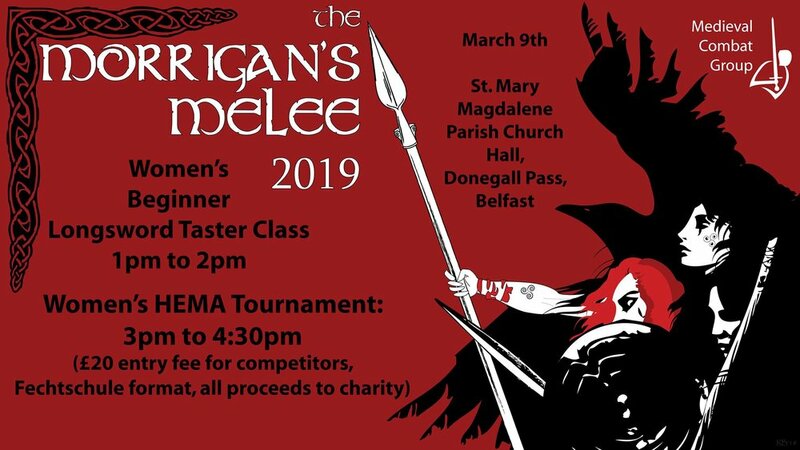 In recognition of International Women's Day, and the awesome swordswomen across the island in the various HEMA clubs, Medieval Combat Group are proud to announce The Morrigan's Melee! On the Saturday after International Women's Day, Medieval Combat Group welcomes women to come and try a short taster longsword class - we'll supply all the equipment and instruction for you to get to grips with the basics of longsword. We also invite as many of the women HEMA practitioners on the island to come up the same afternoon for a mixed weapon Fechtschule style tournament. We'll have multliple rings for the fechtschule sparring, including one for nylon, and some loaner weapons. All we ask is that you have current membership/insurance through a HEMA group. If suitable equipment is an issue and you can't borrow some through your own group, please give us a shout and we'll see what we can do to help. The taster classes are open to participants only, but we're more than happy for people to come along to watch the fechtschule and support the fencers! We may even have some show and tell of equipment and some sparring demos in the time in between! And of course a donation box for our chosen charity. Registration for taster classes and fechtschule tournament will be opened next week. All proceeds will go to an excellent charity, which we'll announce next week as well!